Source: Jarett Henderson, “Banishment to Bermuda: Gender, Race, Empire, Independence and the Struggle to Abolish Irresponsible Government in Lower Canada” Histoire sociale/Social History, vol. XLVI, no. 92 (Nov 2013): 321-348. 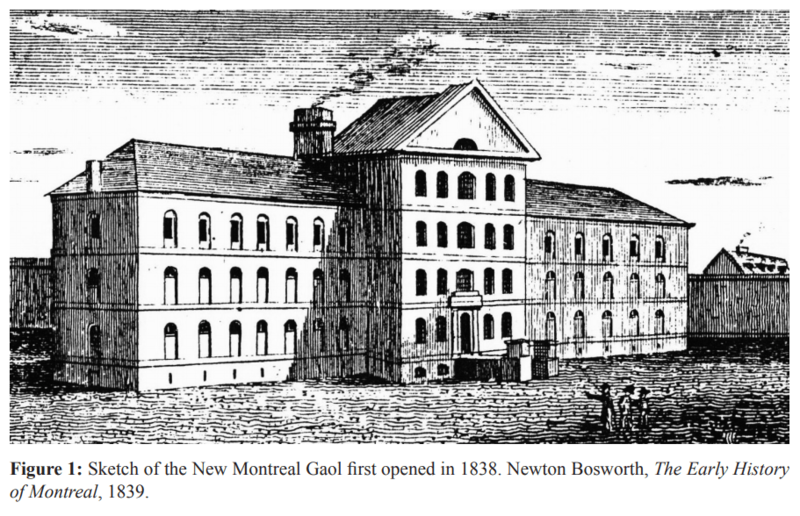 At 3:00 PM on July 3, 1838, Wolfred Nelson stepped, for the first time since his arrest in December 1837, outside the stone walls of the newly built Montreal Gaol (Figure 1). Iron shackles like those used to transport slaves and convicts hung from his wrists and ankles. 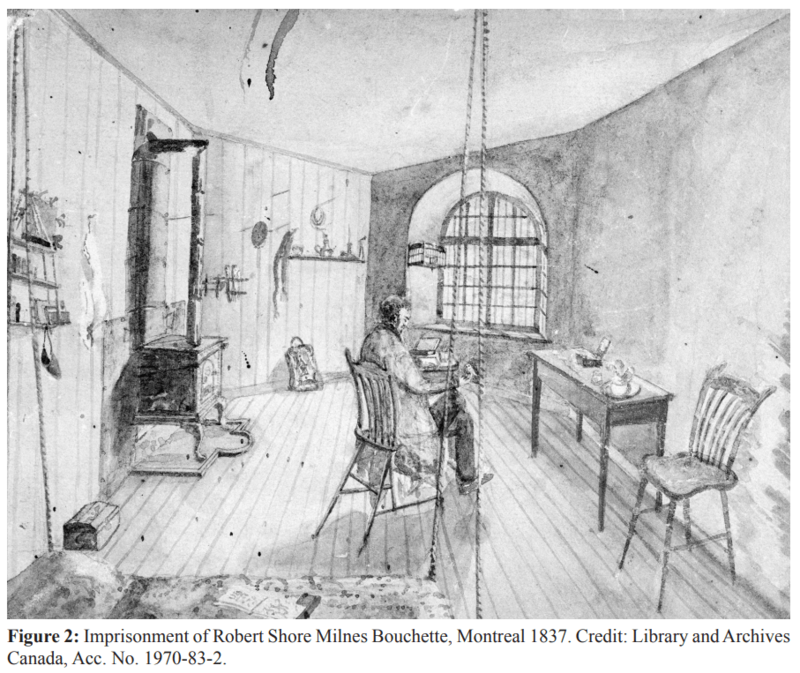 Heavy chains bound him to Robert Bouchette, who, like 515 other canadien reformers, had been arrested for leading an insurrection against the British empire. This day Nelson, Bouchette, and six other white British subjects – all Patriotes – began a journey that took them from Montreal to Quebec to Hamilton, the capital of the British penal colony of Bermuda. As Nelson moved through the streets of Montreal, the clang of his shackles announced his unfreedom. At a rally that had preceded his arrest, both Nelson and Patriote leader Louis-Joseph Papineau had argued that British imperialism enslaved the white settler population of Lower Canada. However, on this July day, with Papineau exiled in the United States, this racialized rhetoric of political slavery once used to demand political independence had been replaced with the coolness of iron. These symbols of unfreedom, known to white settlers and Aboriginal peoples along the St. Lawrence for generations, vividly marked Wolfred Nelson, Robert Bouchette, Rodolphe DesRivières, Henri Gauvin, Siméon Marchesseault, Luc Masson, Touissant Goddu, and Bonaventure Viger as a different sort of British subject. The vision of empire these Patriotes imagined was one in which white, male, and bourgeois colonial subjects, regardless of religion or ethnicity, could enjoy the “right” of British subjects to govern themselves. In November and December 1837, their dedication to this vision of empire had culminated in a rebellion that transformed these eight men from loyal subjects to rebels, from freemen to convicts, and from civil to uncivil British subjects. Tracing the process by which these eight Lower Canadians became Bermudian convicts helps us to uncover what this transition from freedom to unfreedom can teach us about the intersection of gender, race, independence, politics, and empire during Lord Durham’s tenure as Governor General and High Commissioner of British North America. Though the archives documenting the Patriotes’ removal are sparse, there is no reason to believe that their imprisonment and transportation went unnoticed. A “huge crowd” of Montrealers lined St. Mary’s Street to witness the event, demonstrating public interest in the trans-imperial question of settler self-government. On one level, the Patriotes’ struggle to abolish irresponsible government sought to transform the relationship between metropole and colony, and, in doing so, it raised important questions about colonial independence; on another, these Patriotes sought to ensure that Canadiens, as white non-British British subjects, received political rights that white, bourgeois, and British men in England and its empire were increasingly demanding: specifically, the right to govern themselves. Some in the crowd would have come to offer their support for settler self-government, welcoming the re-ordering of empire promised by the abolition of irresponsible government; others vehemently opposed any change to the colonial order of things and cheered the departure of these “rebels.” Louis Perrault, whose brother Charles-Ovide had been killed in battle at Saint-Denis on November 22, 1837, witnessed Nelson’s removal from gaol. Perrault carefully recorded that the men were chained together “Nelson with Bouchette, DesRivières and Gauvin, Marchesseault with Masson, [and] Goddu and Viger” as they made their way along the city’s cobblestone streets. Montrealers, like British subjects in Bermuda, New South Wales, and Britain, were also familiar with the moral, racial, and gendered implications of unfreedom that Maya Jasanoff, Kirsten McKenzie, Zoë Laidlaw, and Catherine Hall have charted. Their scholarship has demonstrated the myriad ways in which debates over slavery and convicts thrust definitions of morality and manliness, independence and race into flux throughout the empire. These trans-imperial debates also paralleled European struggles over extending the franchise and Patriote demands for independence in Lower Canada, though the latter have often been excluded from this narrative. Once the men were aboard the Canada, the steamer that carried them to Quebec, the irons were removed from their swollen wrists and ankles. In Quebec, the city that was then home to Governor General Durham and his family, the men explained to Charles Buller, one of the councillors who had sanctioned the Bermuda Ordinance that made their transportation possible, how their enchaînement had stained their reputations. “We explained to Mr. Buller,” Marchesseault wrote to his parents, “our great surprise when our hands were chained with infamous irons; the same irons that are used only for the vile, the poor, and the malicious.” “We further explained,” he continued, “that our shackling could have had disastrous consequences and that Lord Durham ought to testify his disapproval of it, for our friends did not expect such a treatment.” Buller was an especially well networked agent of empire: he had intimate ties linking him to Durham, Harriet Martineau, and William Molesworth and had been involved with the 1832 British Reform Act and the 1837 Select Committee on Convict Transportation before his appointment by Durham to the Special Council of Lower Canada in 1838. Buller assured Marchesseault that, had Durham suspected such treatment, he would have intervened. In part because the Patriote press had been shut down following the 1837 rebellion, newspapers in Lower Canada devoted little space to the banishment of Nelson and the others to Bermuda. On July 5, 1838, the Quebec Mercury noted on its last page: “HMS Vestal, having on board W. Nelson, Bouchette, etc, sailed for Bermuda yesterday morning, at half past 5 o’clock.” Durham’s official correspondence is equally sparse: “The state prisoners sailed this morning in Her Majesty’s ship Vestal, for Bermuda.” The historical significance of the events that surrounded the removal of these eight men from Lower Canada and their transition from colonists to convicts has been overshadowed by histories of penal transportation to Australia from other British colonies and studies of the 59 men transported to New South Wales in September 1839 for their role in the November 1838 rebellion in Lower Canada. Instead, this paper focuses on the eight Patriotes transported to Bermuda by Lord Durham’s administration in July 1838, a consequence of their involvement in the 1837 rebellion that had led to Durham’s presence in British North America in the first place. Imperial personnel and reform networks linked Lower Canada and Lord Durham’s administration to other empire-wide debates, in particular, that about convict migration. This broader framework is also reflected in the accounts of the 1837 rebellion that Nelson, Bouchette, and Marchesseault wrote as they made their way to Bermuda aboard HMS Vestal, as well as the imperial predicament that the arrival of these men ignited in Bermuda on July 24, 1838. Ultimately, the paper illustrates the importance of moving beyond national (and nationalist) narratives to reconfigure the struggle for responsible self-government as a colonial project that occurred alongside the parallel histories of abolition and convict transportation. The campaigns to abolish slavery and end convict transportation, then, like Patriote demands for settler self-government, existed within an imperial world where the very categories of gender, race, and independence, upon which imperial rule depended and drew its legitimacy, were being renegotiated. By the late 1830s, the political structures of British imperial rule in Lower Canada, once described as being “founded on principles of liberty and exclud[ing] all sorts of slavery,” were being depicted as institutions that enslaved the French and English “races” in the colony.19 On March 31, 1836, L’Echo du Pays, a newspaper that supported a Patriote view of empire, published an article by Wolfred Nelson. Nelson, whose loyalist mother had fled New York during the American Revolution, expressed his loyalty and frustration with empire that day: “It is our duty and it is in our interest to remain subjects of England, but we cannot continue to be subjects if we will not be treated as such, but rather as slaves.” The distinction Nelson made between free and unfree British subjects drew on ideas of manly duty imbricated with, and complicated by, notions of empire, race, and independence. He linked colonial reform to slavery, suggesting that British subjects in Lower Canada were not being treated as loyal, white freemen should. His use of such rhetoric linked local, Patriote, and colonial politics to British domestic and imperial debates over parliamentary reform (1832), slave emancipation (1833), and convict transportation (1837), all of which threatened deep-rooted ideas that equated whiteness with freedom and blackness with unfreedom. In the predominantly francophone colony of Lower Canada and in anglophone Upper Canada, white, loyal, and politically engaged male British subjects, frustrated by what they described as the vicieuse and irresponsable nature of imperial rule, appealed to the wider population through a rhetoric of political enslavement similar to that employed by American Patriots, Loyalist refugees, English reformers, abolitionists, and feminists. In Lower Canada, over ten years of Patriote frustration with “imperial indecision” culminated in a rally at Saint Charles-sur-le-Richelieu, west of Montreal, on October 23 and 24, 1837. Here, at the Grande Assemblée des Six-Comtés, Wolfred Nelson and Luc Côté delivered two violent and extreme speeches that called for open revolt. Louis-Joseph Papineau, the man who embodied Patriote politics and masculinity, praised the “wise” authors of the American Declaration of Independence and called for the removal of “la longue et lourde chaîne d’abus” and for “the emancipation of Lower Canada from bad government.” Just weeks later insurrection rocked the countryside, making “rebels” out of white, primarily French, British subjects whose vision of empire, like that of Loyalist refugees in the Bahamas and Nova Scotia, forced them to take action against a metropolitan vision of empire that hindered their ability to act as white, bourgeois, and politically engaged men should. When the flames of protest were finally extinguished, martial law had been proclaimed (a tactic the British frequently used to crush slave rebellions), habeas corpus suspended, and 515 Patriotes, whose commitment to reform now branded them as uncivil and disloyal British subjects, arrested. The debates of the British Parliament suggest that this “Canadian Rebellion” was an imperial issue that complicated Prime Minister Melbourne’s “already difficult task of holding his government together.” Not since American British subjects first demanded independence in 1775 had white colonizers taken up arms in such numbers to demand constitutional change. The British statesmen who oversaw the governance of Britain’s empire were especially perplexed by what had caused white French Canadians to undertake such a “disloyal,” rebellious, and uncivil act. To answer this question Queen Victoria appointed John George Lambton, the first Earl of Durham, Governor General and High Commissioner of all British North America. In addition to his administrative responsibilities as governor of Lower Canada, Durham was to inquire into the causes of this trouble, report on the present state of Her Majesty’s “possessions” in British North America, and make recommendations for their future administration. To assist Durham in “preserving the integrity of the empire,” Melbourne’s government (with the near-full support of a minority Parliament) suspended the constitution of Lower Canada, but not that of Upper Canada, and voted to give Durham extensive, almost dictator-like powers to govern in the wake of rebellion. Positioning the question of demands for settler self-government and political independence in Lower Canada alongside other questions of reform in the British empire reveals that the recommendations made in Durham’s 1839 report to assimilate the French and English “races” and grant independent self-government to most white, male, and bourgeois subjects in the colony were part and parcel of changing imperial understandings of gender, race, and independence. The decision of the imperial Parliament to suspend the constitution of the largest white settler society in its empire was a difficult one that rested on Durham agreeing to be governor of Lower Canada. When Lord John Russell introduced the bill, he proclaimed his regret that his manly “duty” forced him to “ask the House to suspend, though only for a time, the constitutional liberties of that portion of the British territories.” Hansard indicates that those in the Commons generally agreed on two things pertaining to the Canadian Rebellion: first, that any decision made about the administration of Lower Canada must only be temporary; and second, that Lower Canada must not be totally void of political machinery as it was “so important a portion of the British empire.” Their solution – the Canada Government Bill – established a new form of legislative body for Lower Canada that was modelled after a council in the Cape Colony, where, as in Lower Canada, two white European races ruled over indigenous peoples. This Special Council was to operate until November 1, 1840, when British statesmen hoped that a “free constitution” would again govern the lives of the French and English British subjects in Lower Canada. Colonial Secretary Glenelg admitted, as have Canadian historians, that the Special Council was an unfortunate institution “justified by the exigency of the times and circumstances.” Though Canadian historians interpret this council as both “exceptional” and “unfortunate,” this consensus has often been reached at the expense of any sustained study of the Special Council appointed by Lord Durham, the statesman for whom this body had been created. There is no question that between April 1838 and February 1841 the Special Council was an extraordinary site of political activity in Lower Canada that legislated on issues ranging from marriage and dower to ensuring that the caretaker of the House of Assembly received his salary. The imperial act that had established the council further stipulated that “every subject of deliberation should be brought forward and proposed by the governor [Lord Durham].” Jean Marie Fecteau has characterized Durham’s council as an “interlude” through which we can observe the differing forms of imperial power exercised in Lower Canada in the aftermath of the 1837 rebellion. However, Durham’s Special Council is also important because it silenced the voices, political desires, and imperial visions of those Lower Canadians who opposed colonial reform on nationalist, racist, and ideological grounds. Moreover, the personnel networks of Durham’s Special Council linked the issue of settler self-government to imperial ideas of gender, race, and freedom being investigated by William Molesworth, Charles Buller, and the 1837-1838 Select Committee on Convict Transportation. preserving the loyalty of Lower Canadians. Durham’s decision, then, to distance his administration from personnel networks in Lower Canada was welcomed precisely because his appointees were removed from the colonial networks that had ignited rebellion. Durham’s appointment of his own councillors also affirmed his determination to view the “Canadian Rebellion” as the empire’s problem. To assist him in what he described as a “superhuman” task, Durham appointed Vice Admiral Sir Charles Paget, Major General Sir James Macdonell, the Honourable Charles Buller, the Honourable Colonel George Couper, and the Honourable Lieutenant Colonel Charles Grey. Each councillor swore allegiance to Victoria and her empire as prescribed by Imperial Act, 1st Victoria, Chapter IX and pledged that he would do all that loyalty required to protect Victoria’s possessions in North America. Durham hoped this small circle of intimates would preserve his reputation as a reformer and continue to garner him the loyalty that Lower Canadians had thus far accorded his government. Of these five men, Charles Paget, James Macdonell, George Couper, and Charles Grey had both military training and previous experience with British imperial politics. In contrast to the press in Canada, Durham’s political adversaries in England considered his council a “sham council” because it did not include any local politicians and was comprised of men from Durham’s staff and household. Zoë Laidlaw has found that, though seemingly controversial in Parliament, this practice was far from uncommon among the personnel and humanitarian networks of this period and that very few imperial networks were ever distinct. “Just as most individuals had a variety of identities,” she writes, “so they belonged to multiple sets of connections.” There is no question that ties of family, friendship, and obligation bound Durham and his Special Councillors; furthermore, these ties were crosscut by others that linked Durham’s Special Council of Lower Canada to parliamentary reform, the question of settler self-government, and the debate over the efficacy of convict transportation. The very ties of family, friendship, and obligation that kept Durham removed from divisive Lower Canadian politics also established a personnel network that linked the colony to Bermuda, the empire-wide debate around the question of unfree labour, and the work of the Select Committee on Convict Transportation. The Molesworth Committee, so named for its radical chairman William Molesworth, was established in July 1837 as Lower Canadians were gathering in the countryside to demand the abolition of irresponsible rule. The final report of the Molesworth Committee, published in August 1838, revealed that colonists in Bermuda, New South Wales, and Van Diemen’s Land took little pleasure in their colonies’ status as receptacles of the empire’s most unwanted. Recent work on South Africa and Australia has pointed to the ways free, white, male colonists turned their opposition to convict transportation into a politically charged metaphor to demand independent, colonial self-government while metropolitan officials in England turned to the presence of unfree labourers as evidence against granting of new forms of colonial government. What is particularly striking about the public outcry over convict transportation is its connection to the moral outrage first expressed over slavery and the effects this had on imperial understandings of gender, race, and independence. As Kirsten McKenzie makes clear, the report of the Molesworth Committee “explicitly linked” personal unfreedom and questions of morality, gender, and race to the very structures of imperial rule. Charles Buller, one of Durham’s five councillors, played a central role in Durham’s negotiations with the imprisoned Patriotes that was likely influenced by his involvement in this campaign to end convict transportation. Durham’s Special Council met on June 28, 1838, to discuss the work of Thomas Turton, Charles Buller, and John Simpson, the collector of customs at Coteau-du-Lac that had resulted in a confession of culpability negotiated between Durham’s administration and the eight Patriotes. Whereas local newspapers had reported on the sittings of the Legislative Assembly of Lower Canada prior to its suspension, few records remain that detail the inner workings of the Special Council. The published Journals of the Special Council note only the dates of meetings, those councillors who attended, votes, and the ordinances passed. Even the colonial press, which dutifully transcribed the passed ordinances, contain no information about the in camera meetings of the Special Council. Hence it is difficult to determine what occurred at the meeting that led to the passing of the Bermuda Ordinance. Yet traces remain. Charles Grey recorded that the meeting commenced at five o’clock in the building that once housed the Legislative Assembly of Lower Canada. Durham, according to Colonial Office regulation, chaired the meeting. The Journals of the Special Council indicate that Durham proposed two ordinances that were “severally read” and “agreed to unanimously.” If there was any debate over the fate of these eight men, there is no record of it. Durham then adjourned the first meeting of his Special Council. News that the Special Council had unanimously approved the Bermuda Ordinance made its way quickly from the Castle of St. Louis and private correspondence to the printing presses of Quebec City. On June 29, 1838, the Quebec Gazette was the first to report the ordinance and the proclamation. The following week, Le Fantasque praised the Special Council and Durham: “In short, all the acts of the Governor have been marked with the stamp of precision, skill, firmness, and independence.” The only paper to speak out against the ordinance was the Montreal Herald, which considered the measure “impolitic, as it lets loose again upon society those individuals who have been the prime disturbers of the public peace, and will most assuredly make assurance double sure to the habitants that the British Government dares not punish treason.” The Quebec Mercury made quick work of the Herald’s conspiratorial article: “We do not think the exiled parties themselves will adopt [the Herald’s] reading of the Ordinance.” Rather than reprint the contentious article, the Mercury satisfied its colonial readers by publishing an extract from Le Canadien celebrating the Bermuda Ordinance and Durham’s proposed plans for the future of the Canadian colonies. There is no way of knowing the extent to which Lower Canadians agreed with the editors of their local press or whether Buller’s involvement in the question of convict transportation influenced the Special Council’s decision to transport Nelson, Bouchette, and the others to Bermuda in 1838. Yet, by appointing Buller as a member of his Special Council, Durham had strengthened his administration’s personnel and political networks and fused them to the wider politics of empire. The membership of Durham’s Special Council removed his administration from past networks that had ignited rebellion, thus encouraging Lower Canadians to support Durham, his administration, and, more than likely, the Bermuda Ordinance. Durham and Buller were not the only British subjects in Lower Canada to bring imperial questions to bear on the colony in 1838, however. Wolfred Nelson, Robert Bouchette, and Simon Marchessault, three of the eight men transported to Bermuda, recorded aspects of their removal from Lower Canada in ways that suggest they too were familiar with changing imperial understandings of gender, race, and freedom. Ultimately, these Patriotes’ vision of a reformed empire constructed imperial rule in Lower Canada as irresponsible and as morally reprehensible as slavery and convict labour. In short, Lower Canada’s constitution hindered its inhabitants’ ability, regardless of religion and ethnicity, to claim social and political rights as independent, white, male British subjects. Durham selected his brother-in-law Charles Grey to convey the state intelligence that the Special Council had passed the Bermuda Ordinance to the Patriotes imprisoned in Montreal. No official document archives this transfer of knowledge from Durham’s administration to the Patriotes. Simon Marchessault communicated the news of his impending departure to his wife, Judith Morin, on July 1, 1838. “I have been condemned to exile; I’m leaving tomorrow at four. I am allowed to see my parents, and, if you have enough strength to do so, come and say goodbye to your unfortunate husband.” Bouchette recalled in his memoirs that the decision had been intimated to them upon their signing the confession that made their transportation possible. 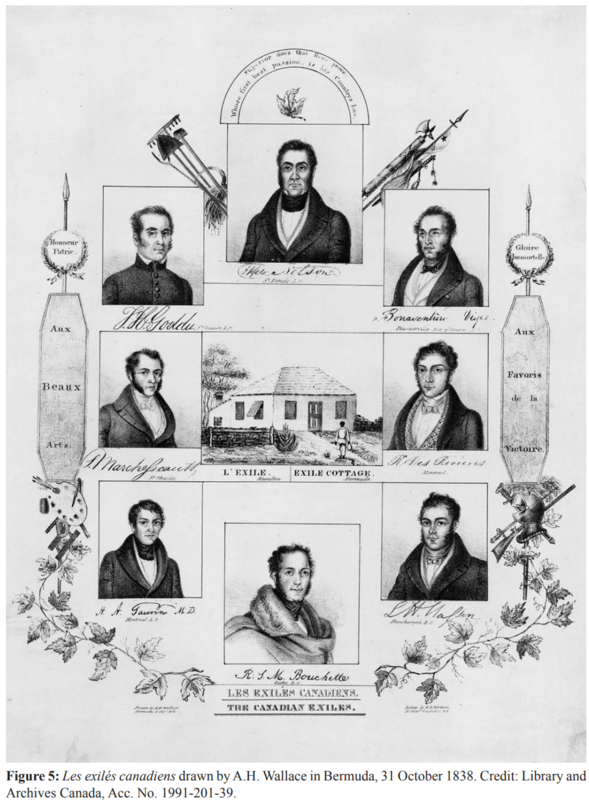 On July 2, 1838, as news of their transportation made its way across British North America, the eight Patriotes were visited by family and friends. Nelson said farewell to his four “petits enfants,” while Masson visited with his 65-year-old mother. DesRivières and Gauvin also met with their families, while Bouchette, whose family resided near Quebec, was visited by “some of his Montreal friends.” Marchesseault was the only Patriote who did not receive a visitor before leaving the Montreal gaol. Though lacking any personal reflections on their impending transportation, the published memoirs, personal journals, and private letters to friends and family penned by Nelson, Bouchette, and Marchesseault cast light on aspects of their political engagement, imprisonment, and transportation to Bermuda. As Nelson, Bouchette, Marchesseault, and the other Patriotes began a journey that removed them from the white settler colony of Lower Canada to the penal and former slave colony of Bermuda, they entered the empire as unfreemen, though they did so in ways that distinguished them from other convicts. The writings of Bouchette, Nelson, and Marchesseault reveal that none of the hardships of convict transportation, so vividly exposed by the Select Committee on Transportation, were imposed upon them. Aboard HMS Vestal they received privileges that “convicts are never allowed.” Bouchette, in chalking this up to the Patriotes’ “quality as political prisoners,” carefully distinguished between British subjects who, like himself, had fought for political change and typical convicts. A letter of Nelson’s that circulated in Lower Canada reveals that these Patriotes “did not have to Demand anything, they Received wines in profusion, cases of oranges, very nice hammocks, poultries, and meats, and, finally that all the gentlemen acted first class.” Moreover, Nelson and the others were allowed to move freely about the Vestal, an opportunity that they used to observe the sea and interact with the ship’s officers, who “appeared to have very liberal opinions as regards to Canadian policy.” According to Charles Paget, the Patriotes received such treatment because they came “on a kind of parole.” Paget later insisted to Bermuda Governor Stephen Chapman that there was little need for anxiety because it was in the Patriotes’ best interest to conduct themselves in an exemplary manner. To give a comprehensive account of the Grievances of which the people of Canada have long complained would involve the political History of the colony for the last five and twenty or thirty years in particular; and this would require a larger volume. But it may not be unimportant succinctly to investigate the causes of the late events in both Canadas, merely to demonstrate how fallacious is the recent opinion that in Lower Canada at least, a deep laid conspiracy existed to over throw the Queen’s Government in that Province. We revolted, not against the person of Her Majesty or her government, but against a vicious colonial administration. We protested and we were mocked; invective, calumny, and insults were used against us. To this end, we had to courageously resist this injustice, or, accept slavery and become a degraded and apostate people. We armed ourselves for our defense, not for an attack. Imperial rule, asserted those aboard the Vestal, enslaved the white settler population rather than acknowledging or upholding the “rights of its subjects, however remote their abode is from the seat of the empire.” It could also, as these Patriotes knew too well, transform loyalists into rebels, freemen into convicts, and civil subjects into uncivil ones. The rhetoric of political enslavement also enabled these Patriotes to depict their new status as unfree British subjects as rooted in whiteness without explicitly stating as much. By depicting imperial rule as a form of unfreedom akin to slavery, Nelson and Bouchette not only asserted that Lower Canadians ought to be treated as freemen, but also that the colony itself ought to be governed as a white settler society should. Unlike in the Cape or New South Wales, where British settlers argued that slaves and convicts tainted their whiteness, in Lower Canada irresponsible government was to blame. Of the many examples they used in their sketch to illustrate this, Bouchette’s and Nelson’s explanation of the “anticonstitutional Resolutions of Lord John Russell” best captures the claims they made to white, manly, political independence. Named for the same British statesman who proposed the suspension of the Lower Canadian constitution following the 1837 rebellion, the Russell Resolutions have long been identified by historians as the spark that caught, igniting rebellion. Officially adopted by Britain’s minority Parliament in March 1837, these ten resolutions were interpreted in Lower Canada as the “the crushing of the weak by the hand of the strong without regard for justice.” Bouchette and Nelson explained that this outright rejection the of the Ninety-Two Resolutions, which were approved by the popularly elected House of Assembly in 1834 (also the year that slaves began their “experimental” freedom across the empire), “disenfranchised the whole of the Canadian population and made them little better than a degraded race of helots; these resolutions filled the whole country with indignation.” The implication of likening the Canadian population to helots meant that French and English British subjects under irresponsible government occupied a racialized space somewhere between slave and subject: both “races” were unfree and, by extension, unmanly and white-ish British subjects. Both Patriotes and their “political adversaries” were energized by this “wanton violation of the provincial constitution to the tyrannical exercise of power” and began publicly arming and training themselves. In November 1837, tensions peaked when warrants of arrest were issued wholesale against the “most popular and influential men in the county” – warrants that Bouchette and Nelson contended were “signed in Blank!” This, concluded Nelson and Bouchette, “is what has been construed into Rebellion, and Revolt. This only is the sum of the conspiracy, charged against the Canadians – This is what has been qualified as treason, and been set down as an attempt to overthrow the dominion of the Queen of England in her Canadian possessions.” The writings of Marchesseault, Nelson, and Bouchette indicate how Patriotes understood the cause of the 1837 rebellion and mobilized the rhetoric of political enslavement to demand greater colonial independence and white settler self-government for Lower Canadian men. It also helped to justify their actions. language of political enslavement be understood in Bermuda, where the politics of race, gender, independence, and empire were complicated by the presence of free whites, free blacks, and unfree white convicts? “How [are] These Worthies … to be Disposed of Here”? Both Lee and Chapman were likely surprised, then, when not months, but just six days later, the HMS Vestal was sighted off Ireland Island, the home to Bermuda’s convict establishment and the British navy dockyards (Figure 3). Though Bermuda shared little with Lower Canada, its colonial administrators, like those in Quebec City, were also endeavouring to comprehend and influence where their colony fitted in an imperial world that was being rapidly transformed. This was especially true for Bermuda’s recently freed black population, convict labourers, poor white settlers, and former slave owners. Chapman had arrived in Bermuda from Gibraltar in 1832 and spent the 1830s navigating Bermudians through the trans-imperial debates over slaves and convicts that thrust meanings of independence, freedom, manliness, and race into flux. As Chapman’s administration was preoccupied by the issue of bonded labour, Patriotes in Lower Canada were demanding that they be treated as free British subjects because they were not slaves. In February 1834, when the Emancipation Bill was introduced into the Bermuda House of Assembly, no provisions for slave apprenticeships were included, making Bermuda the only British colony to pass legislation that promoted what Henry Wilkinson has called “unconditional emancipation.” Yet in 1838 one problem remained: compensating Bermuda’s 1,100 former white slave owners for their loss of property in the form of 4,203 black slaves. This aftershock of emancipation was not the only issue to demand Chapman’s attention. In addition to governing the white settlers and free blacks, Chapman was also Superintendent of Convicts. Though Bermuda’s convict establishment was small by imperial measure, it was nonetheless significant when compared to the number of free whites in the colony. In the 1830s, as social and political opinions about bonded labour were changing across the empire, colonies were affected in particularly local ways. Chapman knew of “the strong objection” that Bermudians had to their tarnished reputation as a penal colony. Yet, just months earlier, the colonial legislature had unanimously voted to have 23 convicts deepen the harbour where the Vestal had moored. For four days the Vestal remained docked off Bermuda’s northern shore. Forced to endure the hot Bermudian sun aboard a vessel on which they had been confined for more than three weeks, the Patriotes knew little of Chapman’s colonial anxieties, while the convict hulks across the harbour surely served as a reminder of their own. But these Patriotes were a different sort of prisoner: they had been sent to Bermuda, a colony known throughout the British imperial world as a better sort of convict colony; they were transported by unconventional means; they had not received a trial before a judge; they had been shackled – in error? – as they left Lower Canada; and they had not been secured aboard the Vestal. The characterization of Bermudan convicts as occupants of a privileged place in the taxonomy of penal colonies has been a common theme in Bermuda historiographies. In transporting these men to Bermuda, Durham’s Special Council worked within contemporaneous imperial understandings and Lower Canadian precedents, but these Patriotes were British subjects betwixt and between categories in an imperial world that not only depended upon ordering colonies, genders, and races into hierarchies, but was also in the process of reforming that very order. The presence, then, of these men in Bermuda posed for Chapman, as their political engagement and incarceration had done for Durham in Lower Canada, a vexing problem. Now Chapman and his council had to determine, as Durham explained when he had proclaimed the Bermuda Ordinance, what restraints were necessary “to prevent the [Patriotes’] return to [Lower Canada].” Chapman and the Executive Council of Bermuda, eight white men, half of whom had owned slaves, met at Government House atop Langton Hill (Figure 4) on July 25, 1838, to debate the fate of these “worthies.” The minutes of the Executive Council reveal that the rhetoric of enslavement used to justify the 1837 rebellion by those aboard the Vestal had little political currency in Bermuda. Rather, it was the “parole of honour” that the Patriotes had signed before departing Quebec that received the most attention. Councillors in Bermuda expressed concern that it ascribed a social and political meaning to the “honour” of these men that could not, and should not, be accorded to those confined to the convict hulks. Yet Chapman was as anxious an imperialist as Durham, and, like the Governor General, he sought the advice and opinion of his legal advisors to determine what measures “would be expedient for him adopt.” He turned to John Harvey Darrell, the attorney general and former mayor of Hamilton, and Duncan Stewart, the solicitor general, for his answer. While Stewart and Darrell deliberated, Nelson, Bouchette, and the others remained aboard the Vestal where they were visited by some of the island’s newly freed black population who were selling water and fresh produce to those around the harbour. This colonial encounter between free blacks and once-free whites vividly captures the limitations of the rhetoric of enslavement in Bermuda: in Lower Canada, where the lived experience of slavery would be historicized in the 1840s as having barely existed, it was possible to argue that irresponsible government enslaved white, though “racially” different, British subjects; in Bermuda, freedom and political independence were coloured differently. The fate of these extraordinary British subjects was eventually determined on July 27, 1838. That day Chapman’s council voted to endorse Darrell’s and Stewart’s findings. The council decided that, since the Patriotes had arrived under “peculiar circumstances,” they should “come under some stipulation for their movements.” Even though Chapman and his council considered it peculiar that Durham had located “honour” in the word of these men, they decided that they would too. Years later Bouchette recalled that word of their permission to land reached them by way of an individual whom he racialized as having a “visage noir.” Bouchette’s observation indicates the complexities of defining and identifying “race” in the 1830s. In Bermuda, colour or complexion visibly marked racial difference; in white Lower Canada, differences of race were more often than not located in and expressed through cultural references to the French or English races and not their whiteness. Yet this should not mean that whiteness had no role in why some Patriotes demanded the political changes they did. Bermuda forced these white Patriotes to grapple with differences rooted in complexion rather than culture, indicating that notions of whiteness were often unspoken aspects of Lower Canadians’ “colonial common sense.” Nonetheless, the rhetoric of enslavement that these Patriotes employed to rally people to their cause drew upon ideas about white, manly political independence and motivated French British subjects to resist British imperial rule. Ultimately, colonial reform, abolition, and convict transportation transformed long-held ideas about race, gender, and political freedom in Lower Canada, Bermuda, and the empire as well as the imperial institutions that differentiated British subjects based on such distinctions. On the afternoon of Saturday, July 28, 1838 Nelson, Bouchette, Viger, Marchesseault, Gauvin, Goddu, DesRivières, and Masson signed their fourth parole of honour. They promised “not go or travel beyond such limits by land or by water, within the said islands of Bermuda.” They then stepped off the Vestal, within sight of the convict hulks, and marched, shackle-free, through a crowd of free black and white Bermudians who had gathered to witness their landing. That Tuesday Lee informed readers of the Royal Bermuda Gazette that these Lower Canadians had “much to be thankful for [in Bermuda]”: “In the first place, for the moderate punishment that has been meted out to them for their very high offences: banishment to the Bermudas; and secondly, the light restrictions which the Governor and Councillors have laid on their liberty, by only limiting them to the main island and merely placing them upon the parole of their honour.” Lee’s intimation that these men were Patriotes in paradise (Figure 5) parallels arguments made by the Select Committee on Convict Transportation that had exposed the “better character” of Bermuda convicts. Through Buller’s work on Molesworth’s select committee, the question of convict transportation made its way to Lower Canada and perhaps even influenced the Special Council’s selection of Bermuda. As Durham explained in an exchange with Colonial Secretary Glenelg that September, he was pleased at not having to send the Patriotes to an essentially penal colony like those in Australia where “a character of moral infamy” would have been affixed upon them. To be certain, the experiences of unfreedom that Nelson, Bouchette, Viger, Marchesseault, Gauvin, Goddu, DesRivières, and Masson had in Bermuda were markedly better than those convicts whose “hard labour” had built the colony’s breakwater. It would also be misleading to conceive of their banishment in a way that downplayed the hardship of familial separation or their commitment to reforming the political structures that governed Lower Canada and its inhabitants. Loyalty to their vision of a reformed empire had transformed these men from free, bourgeois, white British subjects to the unfree of their own political rhetoric. The Patriotes’ negotiations with Durham’s administration and their own archives cast light on but one small aspect of their transition from civil to uncivil, from loyal to disloyal, and from free to unfree British subjects. This history is part of a longer “struggle of race” in post-conquest Quebec/Lower Canada that has been void of “colour” and dismissive of slavery, especially its legacy on the politics of racial difference for all British subjects along the St. Lawrence. Situating Lower Canada and Lord Durham’s administration outside national and nationalist narratives and alongside the parallel histories of abolition and convict transportation allows us to reconfigure the struggle to abolish irresponsible government as a colonial project that was about political independence and settler self-government as well as changing definitions and hierarchies of gender, race, and freedom within the broader British empire. Nelson and his fellow Patriotes spent less than four months as prisoners in paradise. On August 15, 1838, Britain’s minority Parliament forced Melbourne’s government to overturn the Bermuda Ordinance and issue an Act of Indemnity that proclaimed the Patriotes to be freemen. When news of the disallowance reached Lower Canada, the white settler population, French and English, Patriote and Tory, were riled, albeit for very different reasons, to a fever pitch that had not been witnessed since before the 1837 rebellion. In Quebec, Montreal, and Toronto, effigies of Prime Minister Melbourne, Colonial Secretary Glenelg, and Lord Brougham (the nobleman who demanded the disallowance) were set ablaze by those tired of metropolitan meddling in colonial affairs. In Quebec, thousands more came to sign a public address supporting Durham and the Bermuda Ordinance. Across Lower Canada, the colonial press publicly reignited the “racial struggle” of French and English that Durham subsequently documented, entrenching the culture-as-race divide between French and English, loyal and disloyal, and civil and uncivil subjects that continues to shape histories of this white settler society. A frustrated Durham resigned that October. On November 3, 1838, less than 48 hours after Durham’s departure, a second rebellion in less than twelve months shook Lower Canada. On the day that rebellion re-erupted in Lower Canada, a different scene took place in the mid-Atlantic: the Persevere set sail for North America with the eight newly freed Patriotes. Their struggle to abolish irresponsible government and the attempts of Lord Durham’s 1838 administration to keep Lower Canada a part of the empire were shaped by events that occurred far from the St. Lawrence. To understand how Patriote demands for colonial independence fit with the argument of imperial historians – that Durham’s report established the blueprint for making “white settler societies” across the empire – we must return both Patriote politics and Lord Durham’s administration to the imperial frame that made each necessary. Doing so suggests that the campaigns to abolish slavery and end convict transportation, like Patriote demands to abolish irresponsible government in Lower Canada and Durham’s 1839 report recommending responsible self-government for the British North American colonies as well as the assimilation of the French and English “races,” existed within a trans-imperial world where the very categories of race and political independence were being hotly contested. The banishment of these eight Patriotes to Bermuda in July 1838, and their return just months later, highlights the complex contours of this imperial world. 1. The rebellion of 1837 has garnered an expansive historiography in both French and English that is impossible to acknowledge here. The most recent contributions to this conversation are: Michel Ducharme et al., “Macdonald Roundtable,” Canadian Historical Review, vol. 94, no. 1 (March 2013), pp. 80-112; Michel Ducharme, Le Concept de Liberté au Canada à l’époque des Révolutions atlantiques 1776-1838 (Montreal and Kingston: McGill-Queen’s University Press, 2010); Éric Bédard, Les réformistes : une génération canadienne-française au milieu de XIXe siècle (Montreal: Boréal, 2009); Bryan Palmer, “Popular Radicalism and the Theatrics of Rebellion” in Nancy Christie, ed., Transatlantic Subjects (Montreal and Kingston: McGill-Queen’s University Press, 2008), pp. 403-438; Louis-Georges Harvey, Le printemps de l’Amérique française : américanité, anticolonialisme et républicanisme dans le discours politique québécois, 1805-1837 (Montreal: Boréal, 2005); Jeffrey McNarin, The Capacity to Judge (Toronto: University of Toronto Press, 2000); Cecilia Morgan, Public Men and Virtuous Women (Toronto: University of Toronto Press, 1996); Allan Greer, The Patriots and the People (Toronto: University of Toronto Press, 1993); Carol Wilton, Popular Politics and Political Culture in Upper Canada, 1800-1850 (Montreal and Kingston: McGill-Queen’s University Press, 2001); Allan Greer and Ian Radforth, eds., Colonial Leviathan (Toronto: University of Toronto Press, 1992). 2. Brett Rushforth brilliantly makes this history visible in his Bonds of Alliance: Indigenous and Atlantic Slavery in New France (Chapel Hill, NC: University of North Carolina Press, 2012). 3. Marilyn Lake, ‘‘The Gendered and Racialised Self Who Claimed the Right to Self-Government,’’ Journal of Colonialism and Colonial History, vol. 13, no. 1 (Spring 2012); Radhika Mohanram, Imperial White: Race, Diaspora, and the British Empire (Minneapolis: University of Minnesota Press, 2007); Catherine Hall, Civilizing Subjects: Metropole and Colony in the English Imagination, 1830-1867 (Chicago: University of Chicago Press, 2002) and White, Male, and Middle Class: Explorations in Feminism and History (London: Routledge, 1992); Donal Lowry, “The Crown, Empire Loyalism, and the Assimilation of Non-British White Subjects in the British World: An Argument Against ‘Ethnic Determinism’,” Journal of Imperial and Commonwealth History, vol. 31, no. 2 (May 2003), pp. 96-120; Saul Dubow, “How British was the British World? The Case of South Africa,” Journal of Imperial and Commonwealth History, vol. 37, no. 1 (March 2009), pp. 1-27. 4. On Lord Durham and colonial reform, see Jarett Henderson, “Uncivil Subjects: Metropolitan Meddling, Conditional Loyalty, and Lord Durham 1838 Administration of Lower Canada” (PhD thesis, York University, 2010); Bruce Curtis, “The ‘Most Splendid Pageant Ever Seen’: Grandeur, the Domestic, and Condescension in Lord Durham’s Political Theatre,” Canadian Historical Review, vol. 89, no.1 (March 2008), pp. 55-88; Chester New, Lord Durham (Toronto, 1929); Stuart Reid, Life and Letters of the First Earl of Durham, 1792-1840, 2 vols. (London, 1906); Frederick Bradshaw, Self-Government in Canada, and How it was Achieved: The Story of Lord Durham’s Report (London, 1903). There are significantly more studies that examine Durham’s report: G. M. Craig and Janet Ajzenstat, eds., Lord Durham’s Report (Montreal and Kingston: McGill-Queen’s University Press, 2007); Janet Ajzenstat, The Political Thought of Lord Durham (Montreal and Kingston: McGill-Queen’s University Press, 2007 ); Phillip A. Buckner, The Transition to Responsible Government (Westport, CN: Praeger, 1985); Nicholas Mansergh, The Commonwealth Experience (Toronto: University of Toronto Press, 1983); Ged Martin, The Durham Report and British Policy (Cambridge: Cambridge University Press, 1972); Gerald Craig, Lord Durham’s Report (Ottawa: Carleton University Press, 1963); Marcel-Pierre Hamel, Le Rapport de Durham (Montreal: Éditions du Québec, 1948); Reginald Coupland, The Durham Report (Oxford: Clarendon Press, 1945); The Report of the Earl of Durham: Her Majesty’s High Commissioner and Governor-General of British North America (London, 1902). 5. Joseph Schull, in Rebellion! The Rising of French Canada in 1837 (Toronto: Macmillan, CDG Books Canada, 1996), writes that: “the grim stone jail on the waterfront was surrounded by huge crowds. They filled the streets, jostled along the wharves, and almost blocked the gateway” (p. 142). The newspaper accounts of the removal of the Patriotes are sparse in detail, noting primarily that these eight men had begun a journey that would take them from Montreal to Quebec and then to Hamilton, the capital of Bermuda. For more on the street politics of Montreal, see Dan Horner, “Taking to the Streets: Crowds, Politics and Identity in Mid-Nineteenth-Century Montreal” (PhD thesis, York University, 2010). 6. Julie Evans et al., Equal Subjects, Unequal Rights: Indigenous Peoples in British Settler Colonies, 1830-1910 (Manchester: Manchester University Press, 2003); Elizabeth Elbourne, Blood Ground: Colonialism, Missions, and the Contest for Christianity in the Cape Colony and Britain, 1799-1853 (Montreal and Kingston: McGill-Queen’s University Press, 2002); Alan Lester, Imperial Networks: Creating Identities in Nineteenth-Century South Africa and Britain (London: Routledge, 2001); Anne McClintock, Imperial Leather: Race, Gender and Sexuality in the Colonial Contest (London: Routledge, 1995); Linda Colley, Britons: Forging the Nation, 1707-1837 (New Haven, CN: Yale University Press, 1992). 7. Louis Perrault, Lettres d’un patriote réfugié au Vermont, 1837-1839, ed. Georges Aubin (Montreal: Éditions du Méridien, 1999), p. 130. Joseph Schull wrote that a “great noise” erupted when the crowd realized the men were “enchaînés deux à deux” (Rebellion, p. 142). 8. Maya Jasanoff, Liberty’s Exiles: American Loyalists in the Revolutionary World (New York: Knopf, 2011); Jack P. Greene, ed., Exclusionary Empire: English Liberty Overseas (Cambridge: Cambridge University Press, 2010); Kirsten McKenzie, A Swindler’s Progress: Nobles and Convicts in the Age of Liberty (Sydney: University of New South Wales Press, 2009) and Scandal in the Colonies: Sydney and Cape Town (Melbourne: Melbourne University Press, 2004); Zoë Laidlaw, Colonial Connections, 1815-45: Patronage, the Information Revolution, and Colonial Government (Manchester: Manchester University Press, 2005); Julie Evans, Edward Eyre, Race, and Colonial Governance (Dunedin: University of Otago Press, 2005); Lester, Imperial Networks; Hall, Civilizing Subjects. 9. The exclusion of Lower Canada from these histories of independence, gender, race, and reform is especially striking following Laidlaw’s assertion that neither the Cape Colony nor New South Wales, the colonies most often associated with studies of slavery and convict transportation, “received the same degree of metropolitan scrutiny as colonies in British North America or the West Indies” (Colonial Connections, p. 3). See also Jarett Henderson and Bettina Bradbury, “A Difference of Race?” in Mary Anne Poutanen, Stéphan Gervais, and Raffaele Iacovino, eds., Living in Quebec (Montreal and Kingston: McGill-Queen’s University Press, forthcoming). This would not be the only time that French Canadians turned to wider international and imperial currents to demand political change. Here I am thinking of Pierre Vallières, Nègres blancs d’Amérique. Autobiographie précoce d’un “terroriste” québécois (Montreal: Éditions Partis pris, 1968); Sean Mills, The Empire Within: Postcolonial Thought and Political Activism in Sixties Montreal (Montreal and Kingston: McGill-Queen’s University Press, 2010). 10. Robert S.-M. Bouchette, Mémoires de Robert-S.-M. Bouchette, 1805-1840 (Montreal, 1903), p. 68; Library and Archives Canada [hereafter LAC], MG24 A34, Nelson fonds, vol. 2. 11. Schull, Rebellion, p. 142. 12. Yvon Thériault, “Les Patriotes aux Bermudes en 1838. Lettres d’exile,” Revue d’histoire de l’Amérique française [hereafter RHAF], vol. 16, no. 2 (1962), p. 111. 13. According to Bouchette, the order to shackle the eight men had come from Roch de St. Ours, the Sheriff of Montreal (Mémoires, p. 67). See also Thériault, “Les Patriotes aux Bermudes en 1838,” p. 111. This letter is also reprinted in Le Clarion, March 14, 1930. 14. Quebec Mercury, July 5, 1838. Articles pertaining to the departure were reprinted in Le Populaire, July 4, 1838; Bytown Gazette, July 11, 1838; Kingston Chronicle and Gazette, July 11, 1838; and the Toronto Patriot, July 12, 1838. 15. LAC, MG24 A27, John George Lambton fonds, Vol. 12. 16. Kristy Reid, Gender, Crime and Empire: Convicts, Settlers and the State in Early Colonial Australia (Basingstoke, UK: Palgrave Macmillan, 2007); Beverly Boissery, A Deep Sense of Wrong (Toronto: University of Toronto Press, 1995); Tim Causer, “‘On British Felony the Sun Never Sets’: Narratives of Political Prisoners in New South Wales and Van Diemen’s Land, 1838-1853,” Cultural and Social History, vol. 4, no. 5 (2008), pp. 423-435; John Thompson, “The North American Patriot Prisoners at Probation Stations in Van Diemen’s Land,” Australasian Canadian Studies Journal, vol. 25, no. 2 (2007), pp. 117-146; Thomas Dunning, “Convict Bodies in Van Diemen’s Land,” Australian Studies, vol. 13, no. 1 (1998), pp. 134-144; Brian Petrie, “The French-Canadian Patriote Convict Experience, 1840-1848,” Journal of Royal Australian Historical Society, vol. 81 (1995), pp. 167-183; James Gibson, “Political Prisoners, Transportation for Life, and Responsible Government in Canada,” Ontario History, vol. 67, no. 4 (December 1975), pp. 185-198; R. Watt, “The Political Prisoners in Upper Canada, 1837-8,” English Historical Review, vol. 42 (October 1926), pp. 256-265. 17. Historians in Canada and Quebec have been hesitant to explore what Ann Laura Stoler and Frederick Cooper have termed the “tensions of empire”: those historical parallels binding both Patriote politics and Durham’s administration to histories of race, reform, and rebellion across the empire. See Frederick Cooper and Ann Laura Stoler, “Between Metropole and Colony: Rethinking a Research Agenda” in Frederick Cooper and Ann Laura Stoler, eds., Tensions of Empire: Colonial Cultures in a Bourgeois World, (Berkeley: University of California Press, 1997), pp. 1-58. 18. On historians’ reluctance to move beyond comfortable categories, see Magda Fahrni, “Reflections on the Place of Quebec in Historical Writing on Canada” in Michael Dawson and Christopher Dummitt, eds., Contesting Clio’s Craft: New Directions and Debates in Canadian History (London: Institute for the Study of the Americas, 2009), pp. 1-20. See also Tony Ballantyne and Antoinette Burton, Moving Subjects (Urbana and Chicago: University of Illinois Press, 2009); Alan Lester, “Imperial Circuits and Networks: Geographies of the British Empire,” History Compass, vol. 4, no. 1 (2006), pp. 124-141; Ann Curthoys and Marilyn Lake, eds., Connected Worlds (Canberra: Australian National University Press, 2005); Ann Laura Stoler, “Tense and Tender Ties: The Politics of Comparison in North American History and (Post) Colonial Studies,” Journal of American History, vol. 88, no. 3 (2001), pp. 829-865; Mrinalini Sinha, “Mapping the Imperial Social Formation: A Modest Proposal for Feminist History,” Signs, vol. 25, no. 3 (2000), pp. 1077-1082; Tony Ballantyne, “Race and the Webs of Empire: Aryanism from India to the Pacific,” Journal of Colonialism and Colonial History, vol. 2, no. 3 (Winter 2001); Uday S. Mehta, “Liberal Strategies of Exclusion” in Cooper and Stolar, eds., Tensions of Empire, pp. 59-86. 19. “… founded on principles of liberty and exclud[ing] all sorts of slavery,” Montreal Gazette, March 4, 1790. 20. Wolfred Nelson, Écrits d’un Patriote, ed. Georges Aubin (Montreal: Comeau & Nadeau, 1998), p. 41. 22. Rushforth, Bonds of Alliance; Jasanoff, Liberty’s Exiles; Hall, Civilizing Subjects; Mohanram, Imperial White; Clare Midgley, Women Against Slavery: The British Campaigns 1780-1870 (London: Routledge, 1995); Reid, Gender, Crime and Empire. 23. Report of Commissioners on Grievances Complained of in Lower Canada, Third Report (London, 1837), p. 109. 24. Jasanoff, Liberty’s Exiles; Ducharme, Le Concept de Liberté; Laidlaw, Colonial Connections; McKenzie, Scandal in the Colonies; Kirsten McKenzie, “‘My Voice is Sold, I Must be as Slave’: Abolition, Industrialisation and the Yorkshire Election of 1807,” History Workshop Journal, vol. 64 (2007), pp. 48-73; Paul Pickering, “Loyalty and Rebellion in Colonial Politics: The Campaign against Convict Transportation in Australia” in Phillip Buckner and R. Douglas Francis, eds., Rediscovering the British World (Calgary: University of Calgary Press, 2005), pp. 87-108. 25. Numbers for attendance range between 4,000 and 6,000. See Mario Béland, “Un destin inachevé: l’assemblée des six comtés de Charles Alexander Smith,” Cap-aux-Diamants : la revue d’histoire du Québec, vol. 30 (Summer 1992), pp. 30-33. For more on the rebellion, see J. I. Little, Loyalties in Conflict (Toronto: University of Toronto Press, 2008); Murray Greenwood and Barry Wright, eds., Canadian State Trials: Rebellion and Invasion in the Canadas, 1837-1839 (Toronto: University of Toronto Press, 2002); Greer, The Patriots and the People; Jean-Paul Bernard, Les Rébellions de 1837-1838 (Montreal: Éditions Boréal, 1983); Fernand Ouellet, Lower Canada, 1791-1840: Social Change and Nationalism (Toronto: McClelland & Stewart,1980); Schull, Rebellion; Jacques Monet, The Last Cannon Shot: A Study of French Canadian Nationalism 1837-1850 (Toronto: University of Toronto Press, 1969); Helen Taft Manning, The Revolt of French Canada, 1800-1835 (New York: St. Martin’s Press,1962). 26. Nelson urged the crowd of supporters to “melt our spoons to make bullets.” Quoted in Masson Wade, The French Canadians (Toronto: Macmillan, 1955), p. 167. See also Greer, The Patriots and the People, pp. 226-233. 27. La Minerve, November 2, 1837. On Papineau as the embodiment of Patriote masculinity, see Jan Noel, “Defrocking Dad: Masculinity and Dress in Montreal, 1700-1867” in Alexandra Palmer, ed., Fashion: A Canadian Perspective (Toronto: University of Toronto Press, 2004), pp. 68-89. Thanks to Jenny Ellison for this reference. 28. See, in particular, Part III of Jasanoff’s Liberty’s Exiles. 29. For more on Melbourne’s life and government, see Leslie Mitchell, Lord Melbourne: 1779-1848 (Oxford: Oxford University Press, 1997), p. 99. Peers in Parliament often called events in British North America in 1837 the “Canadian Rebellion.” At times British subjects would be distinguished as “French” or “British” – categories that not only ignored the presence of Indigenous peoples, but also made the whiteness of these French and English “races” a matter of “colonial common sense.” See Ann Laura Stoler, Along the Archival Grain: Epistemic Anxieties and Colonial Common Sense (Princeton: Princeton University Press, 2010). 30. Maya Jasanoff details in Liberty’s Exiles how Loyalists in Nova Scotia, New Brunswick, Jamaica, and the Bahamas expressed their frustration with metropolitan visions of empire through public protests (though on a much smaller scale than those who did so in the Canadas in 1837). For more on the active history of protest in British North America, see Rusty Bitterman, Rural Protest on Prince Edward Island: From British Colonization to the Escheat Movement (Toronto: University of Toronto Press, 2006); F. Murray Greenwood, Legacies of Fear: Law and Politics in Quebec in the Era of the French Revolution (Toronto: University of Toronto Press, 1993); Terence Crowley, “‘Thunder Gusts’: Popular Disturbances in Early French Canada,” Journal of the Canadian Historical Association, Historical Papers, vol. 14, no. 1 (1979), pp. 11-32. 31. LAC, MG24 A27, Lambton fonds, “Commissions and Instructions,” Vol. 4-6. These commissions and instructions were transmitted in Despatch No. 8, Lord Glenelg to Lord Durham, April 3, 183, LAC, MG24 A27, Lambton fonds, Vol. 7. They were also reprinted in Report on the Affairs of British North America (London: Queen’s Printers, 1839). 32. Evans et al., Equal Subjects, Unequal Rights; Henderson and Bradbury, “A Difference of Race?”; James Heartfield, The Aborigines’ Protection Society: Humanitarian Imperialism in Australia, New Zealand, Fiji, Canada, South Africa, and the Congo, 1837-1909 (New York: Columbia University Press, 2011); Ann Curthoys, “The Dog that Didn’t Bark” in Adele Perry et al., Trans-nationalizing Canada (Toronto: University of Toronto Press, forthcoming). 33. In the summer of 1837, Durham had been offered the governorship of Lower Canada but turned it down, having just returned with his family from Russia. 34. British House of Commons, Debates, Vol. 40 cc7-93, http://hansard.millbanksystems.com. 35. See Steven Watt, “State Trial by Legislature: The Special Council of Lower Canada, 1838-1841” in Greenwood and Wright, eds., Canadian State Trials, p. 252. 36. A second uprising in November 1838 led metropolitan statesmen to extend the council’s rule beyond its original 30-month term. 38. The most recent examination of the Special Council is Maxime Dagenais, “‘Le Conseil Special est mort, Vive le conseil Special!’ The Special Councils of Lower Canada” (PhD dissertation, University of Ottawa, 2011). Other studies include Watt, “State Trial by Legislature”; Bettina Bradbury, Wife to Widow: Lives, Laws, and Politics in Nineteenth Century Montreal (Vancouver: University of British Columbia Press, 2011); Greer and Radforth, Colonial Leviathan; Brian Young, The Politics of Codification (Montreal and Kingston: McGill-Queen’s University Press, 1994); Antonio Perrault, “Le Conseil Spécial, 1831-1841,” La Revue du Barreau, III (1943), pp. 130-144, 213-220, 265-274, and 299-307. 39. Jean-Marie Fecteau, “This Ultimate Resource: Martial Law and State Repression in Lower Canada, 1837-8” in Greenwood and Wright, eds., Canadian State Trials, pp. 207-247. 40. Historians, following Durham’s contemporaries, blame his delayed arrival in Lower Canada on his crates of luggage and not the vast stacks of Colonial Office records that Durham had to study if he was accurately to assess the Canadian situation. On the creation of the Lambton archive, see, Jarett Henderson, “I am Pleased with My Lambton Loot: Arthur Doughty and the Making of the Durham Papers,” Archivaria, no. 70 (Fall 2010), pp. 153-176. 41. Georges Aubin and Nicole Martin-Verenka, eds., Insurrection. Examens volontaires, Tome I, 1837-1838 (Montreal: Lux Éditeur, 2004). 42. Amédée Papineau, Journal d’un Fils de la Liberté, 1838-1855, ed. Georges Aubin, (Montreal: Septentrion,1998), p. 180. 43. Georges Aubin, Au Pied-du-Courant. Lettres des prisonniers politiques de 1837-1839 (Montreal: Comeau & Nadeau, 2000), p. 68. 45. LAC, MG24 A27, John George Lambton fonds, Vol. 12. 46. Special Council of Lower Canada, Journals of the Special Council of Lower Canada (1838), pp. 3-4. The five men Durham appointed were connected to the Governor General personally, politically, or both. These personnel networks are explored further later in the article. 47. LAC, MG24 A27, John George Lambton fonds, Vol. 20. 48. Le Canadien, July 2, 1838. 49. Wade, The French Canadians, pp. 80-82. Although this appears to support Watt’s argument about the Tory politics of the Special Council in these years, Watt also privileges the equality of origin in Colborne’s council when comparing it to Durham’s council (“State Trail by Legislature”). 50. The Canadian Antiquarian and Numismatic Journal (1909), pp. 115-116. 51. Le Canadien, July 2, 1838. 52. The oath can be found in LAC, MG24 F30, Charles Paget fonds. 53. See British House of Commons, Debates, Vol. 44, cc.1283; Henderson, “Uncivil Subjects,” chap. 4. 54. Laidlaw, Colonial Connections, p. 15. 55. Parliament of Great Britain, Report of the Select Committee on Transportation (London, 1838). 56. Pickering, “Loyalty and Rebellion,” p. 97; Alan Lester, “British Settler Discourse and the Circuits of Empire,” History Workshop Journal, vol. 54, no. 1 (2001), pp. 24-48; Kirsten McKenzie, “Discourses of Scandal: Bourgeois Respectability and the End of Slavery and Transportation at the Cape and New South Wales, 1830-1850,” Journal of Colonialism and Colonial History, vol. 4, no. 3 (2003). 57. McKenzie, Scandal in the Colonies, p. 124. 58. Report of the Select Committee on Transportation, p. x. 59. LAC, MG24 A27, Lambton fonds, Vol. 26, p. 631-638. 60. Charles Grey, Crisis in the Canadas, 1838-1839: The Grey Journals and Letters, ed. William G. Ormsby (Toronto: Macmillan of Canada, 1964). 61. Journals of the Special Council, p. 3. 62. LAC, MG24 A27, John George Lambton fonds, Vol. 46. 63. Quebec Gazette, June 29, 1838. 64. Le Fantasque, July 12, 1838. 65. Montreal Herald, July 2, 1838. 66. On Monday, July 2, 1838, Le Canadien reported news of “L’amnistie!” on its front page. “After the generosity shown towards the political prisoners, an act which proves how completely all former disastrous influence ought to be repudiated – to be branded as the declared enemy of his country, of the cause of reform, and of the return in all their plentitude, of those liberties and political advantage which belong to us as British subjects” (Quebec Mercury, July 3, 1838). 67. LAC, RG7 G15A, Governor’s Internal Letter Books, Quebec and Lower Canada, Vol. 9, 1830-1939, June 30, 1838, Reel C-921. 68. Siméon Marchesseault to Judith Morin, July 1, 1838, in Lettres à Judith. Correspondance d’un patriote exilé, ed. Georges Aubin (Sillery, QC: Septentrion, 1996), p. 42. 69. Bouchette, Mémoires, p. 66. 70. Articles pertaining to the transportation were reprinted in Le Populaire, July 4, 1838; the Bytown Gazette, July 11, 1838; the Kingston Chronicle and Gazette, July 11, 1838; and the Toronto Patriot, July 12, 1838. 71. Louis Perrault to Dr O’Callaghan, July 4, 1838, in Lettres d’un patriote réfugié à Vermont, pp. 126-129. 72. LAC, MG24 B139, Bouchette fonds; LAC, MG24 B34, Nelson fonds; Bouchette, Mémoires; Marchesseault, Lettres à Judith; Wolfred Nelson, Écrits d’un patriote, 1812-1824, ed. Georges Aubin (Sillery, QC: Septentrion, 1998); Yvon Thériault, “Les Patriotes aux Bermudes en 1838 : lettres d’exile,” RHAF, vol. 16, no. 1 (1962), pp. 117-126; vol. 16, no. 2 (1962), pp. 267-272; vol. 16, no. 3 (1962), pp. 436-440; and vol. 17, no. 1 (1963), pp. 107-112. 74. Report of the Select Committee on Transportation. 75. Bouchette, Mémoires, p. 70. 76. The Canadian Antiquarian and Numismatic Journal (1909), p. 38. 77. Bouchette, Mémoires, p. 76. 78. Henry C. Wilkinson, Bermuda from Sail to Steam: A History of the Island from 1784 to 1901 (Oxford: Oxford University Press, 1973), p. 531. 79. LAC, MG24 B139, Bouchette fonds; LAC MG24 B34, Nelson fonds, Vol. 1. 80. LAC, MG24 B34, Nelson fonds, Vol. 1. 81. Allan Greer, “1837-38: Rebellion Reconsidered,” Canadian Historical Review, vol. 76, no. 1 (1995), pp. 1-18; Ducharme, Le Concept de Liberté. Similar connections were also explored in Stanley Ryerson, Unequal Union: Confederation and the Roots of Conflict in the Canadas, 1815-1873 (Toronto: Progress Books, 1968). 82. LAC, MG24 B139, Bouchette fonds; LAC, MG24 B34, Nelson fonds, Vol. 1. 83. Jasanoff, Liberty’s Exiles, p. 142. 84. Nelson, Écrits d’un Patriote, p. 65; Bouchette, Mémoires, p. 61. 85. “Confession, 18 June 1838,” in Bouchette, Mémoires, p. 62 (emphasis in original). 86. LAC, MG24 B139, Bouchette fonds; LAC MG24 B34, Nelson fonds, Vol. 1; Hall, White, Male, and Middle Class. 87. LAC, MG24 B34, Nelson fonds, Vol. 1; Thériault, “Les Patriotes aux Bermudes en 1838,” RHAF, vol. 16, no. 2 (1962), pp. 270-271. 88. Marcel Trudel, Dictionnaire des esclaves et de leurs propriétaires au Canada français (Montreal: Éditions Hurtubise, 1990), p. 286. 89. LAC, MG24 A27, John George Lambton fonds, Vol. 25. 90. Jasanoff, Liberty’s Exiles, p. 180; McKenzie, A Swindler’s Progress; Pickering, “Loyalty and Rebellion”; Clare Midgley, ed., Gender and Imperialism (Manchester: Manchester University Press, 1998). 91. Bermuda Royal Gazette, July 17, 1838. Thanks to Heather Steel and Jasmine Trimble for copying countless issues of the Gazette. 92. Journals of the Special Council of Lower Canada, p. 3. 93. Bermuda Royal Gazette, July 17, 1838. 94. Wilkinson, Bermuda from Sail to Steam, p. 514. 95. In the 1830s, the British colony of Bermuda was populated by roughly 1,000 convicts, 4,000 black slaves, and 4,000 white settlers (Bermuda Archives, Slave Register, 1834; Wilkinson, Bermuda from Sail to Steam). 96. Report of the Select Committee on Transportation, p. xxxvii. 97. Those aboard the Vestal were not the first convicts from Lower Canada to be sent to Bermuda. Following the establishment of Bermuda as a penal colony in 1824, colonial authorities in Lower Canada began to transport felons to the island. A document in Durham’s private papers indicates that 17 men served their sentences aboard the convict hulks of Bermuda between 1828 and 1838. See Clara Hallett, Forty Years of Convict Labour: Bermuda, 1823-1863 (Bermuda: Juniper Hill Press, 1999); LAC, MG24 A27, John George Lambton fonds, Vol. 21. 98. Much of the literature on the Patriotes transported to Bermuda has focused on the legality of their transportation. Little attention has been paid to the wider imperial world in which their transportation occurred. See Clara Hallett, “Bermuda’s Convict Hulks,” Bermuda Journal of Archaeology and Maritime History, vol. 2 (1990), pp. 87-104; E. Mitchell, “The Bermuda Convict Establishment,” Bermuda Journal of Archaeology and Maritime History, vol. 9 (1997), pp. 120-128; Nina Edwards, “The Canadian Exiles in Bermuda,” Bermuda Historical Quarterly, vol. 37 (1980), pp. 42-45 and 63-68; B. B. Kruse, “The Bermuda Exiles,” Canadian Geographical Journal, vol. 14 (1937), p. 353; Douglas Hemmeon, “The Canadian Exiles of 1838,” Dalhousie Historical Review, vol. 7 (1927), pp. 13-16. 99. Quebec Gazette, June 29, 1838. 101. Jacques Viger and Louis Hippolyte Lafontaine, De l’esclavage en Canada (Montreal: Imprimé par Duvernay frères, 1859); Rushforth, Bonds of Alliance (University of North Carolina Press, 2012); Frank McKay, Done with Slavery: The Black Fact in Montreal (Montreal and Kingston: McGill-Queen’s University Press, 2010). 102. Bouchette, Mémoires, p. 85; Mackenzie, A Swindler’s Progress; Hall, Civilizing Subjects; McKay, Done with Slavery. 104. Thériault, “Les Patriotes aux Bermudes,” RHAF, vol. 16, no. 2 (1926), p. 436. 105. Paroles one and two were signed before the men left Montreal; the third upon their leaving Quebec for Bermuda; the fourth in Bermuda on July 28, 1838. 106. Stoler, Along the Archival Grain. 108. Royal Bermuda Gazette, July 31, 1838. 109. LAC, MG24 A27, John George Lambton fonds, Vol. 20. 110. Here I borrow “Prisoners in Paradise” from an exhibit at the Bermuda Maritime Museum, now the National Museum of Bermuda. I would like to extend my gratitude to Elena Strong for sharing aspects of her research for this exhibit with me. 111. 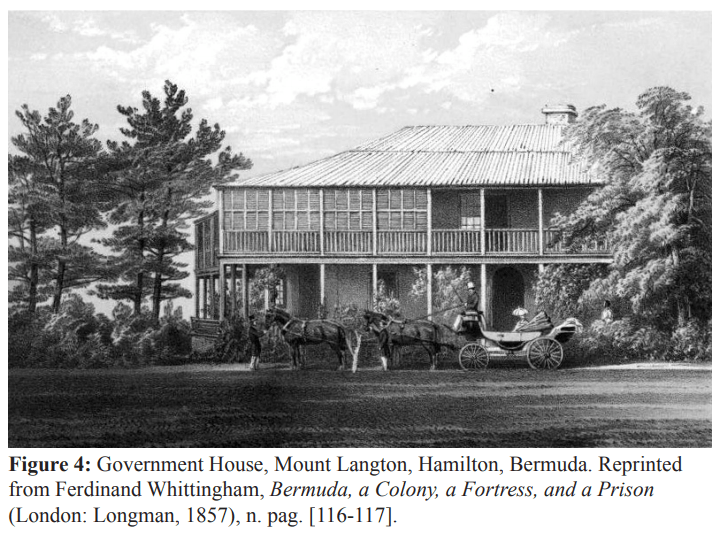 For more on the imperial debate over the Bermuda Ordinance, see chapter 4 of Henderson, “Uncivil Subjects.” For an Australian perspective on the disallowance, see Thomas Gunn, “Convicts to Bermuda: A Reassessment of Earl Durham’s 1838 Bermudan Ordinance,” Australian Journal of Canadian Studies, vol. 25, no. 2 (2007), pp. 7-28. Interpretation 1: Henderson: "Banishment to Bermuda: Gender, Race, Empire, Independence..." by Sean Kheraj and Tom Peace is licensed under a Creative Commons Attribution-NonCommercial-ShareAlike 4.0 International License, except where otherwise noted.